When it comes to meeting construction deadlines there are many contributing factors – sub contractors, budget, adjustments to the original plans, and weather – and the hardest to account for is weather. Construction companies need to get creative in order to meet deadlines when we’ve had as much rainfall as we have the last few weeks in Omaha. 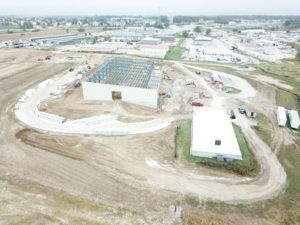 Several weeks ago we told you progress on the Gretna Public Works facility. 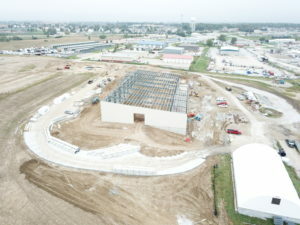 By mid-August, the foundation and paving were being laid, and the steel erection had begun. Since then, we have laid the foundation, erected the building and completed the paving and retaining walls. Rainfall and new concrete are a hard mix, but we have managed to take advantage of dry days – regardless of when they call – to keep the project on track to meet our deadlines. Our teams have been long hours on dry days, even when they fall on weekends. We hope you will continue to check back on the progress of this project!